The University of Oregon’s Zero Waste Program is asking members of the campus community to change their recycling habits to stay on the right side of new rules and at the forefront of sustainable practices. Previously, small plastics were considered recyclable materials, but now students will have to place their finished yogurt or food container in the garbage bin because of citywide changes to recycling requirements. Common cafeteria items like cups, cartons, utensils and wrappers all must be tossed into trash destined for the landfill due to recent changes in the types of recyclables accepted by the largest purchaser of recyclables worldwide, China. According to the city of Eugene, recyclable items will now only include cardboard, paper, cans and jars, as well as plastic or glass bottles and jugs. Bottles and jugs have been defined by the city as any container where the mouth or lid is smaller than the body. The plastics commonly found in yogurt or other nonbottle containers have recently been deemed contaminates in an effort to maximize the city’s waste value. Signs on trash and recycling bins around campus will be updated to fit the recent changes on plastic and are expected to be finished by the end of the term. Karyn Kaplan, co-founder and Zero Waste Program manager, hopes the changes won’t hinder students’ desire to recycle and that they will use the changes to reflect on how they can reduce the amount of waste they generate. Cups on campus have always been a landfill item but are routinely put in with recyclables. Kaplan said that has made them the No. 1 contaminant in recycle bins at the UO. Students often mistake the paper exterior of a coffee cup or other elements of the cup as recyclable, but they are not. “In order for recycling to survive, we have to demand that our products incorporate recycled materials into their production,” she said. Reducing the amount of campus trash bound for a landfill and participating in sustainable practices can also help save the university money. Donny Addison, Zero Waste Program operations manager, oversees all the recyclables, waste and compost that comes through the UO. According to Addison, the UO has to pay $75 to get rid of each ton of garbage, but through recycling the university not only lowers its costs by reducing the amount of trash going to landfill it also earns money by selling recyclables. Sustainable initiatives at the UO have been successful. 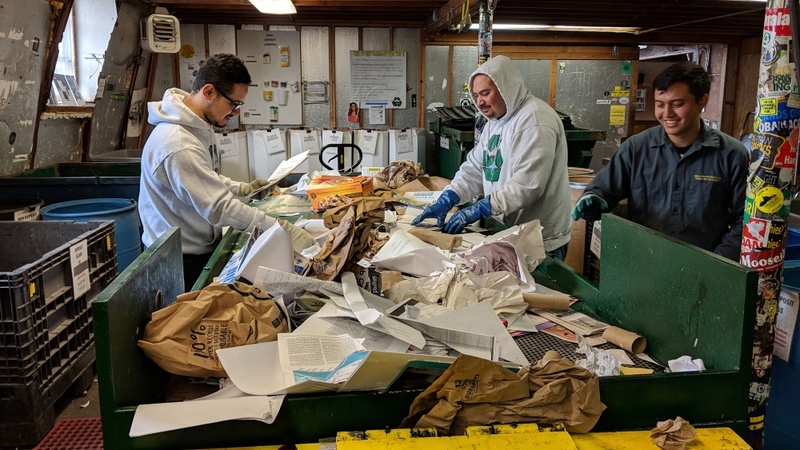 Recently, the UO had about 56 percent waste recovery around campus. Also, programs like the Reusable Office Supply Exchange, or ROSE, give students and faculty an opportunity to save money while reducing waste. “These changes are good because they’re really bringing people to the point of paying attention and realizing that they do care,” Kaplan said. To learn more about the new recycling rules on campus, or to get involved with the UO Zero Waste Program, visit the UO Zero Waste Program website.